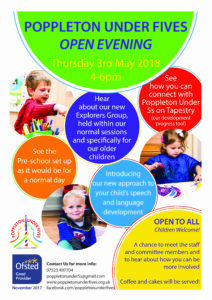 Please come and join us for the Poppleton under 5s Open Evening on Thursday 3 May from 4pm to 6pm. See how the Pre-school works and learn about our new innovations for 2018. Children welcome. Tea/coffee and cakes will be served.